Another exciting, exhausting, exhilarating, and occasionally exacerbating day! I love alliteration. Can you tell? I slept until 7, took Luke for a nice, long walk, watched “Community” (one of the best episodes ever), and arrived at CFS at 9. My OCD kicked in, and I became obsessed with ensuring that the ring straps were in the same direction. And evenly spaced on the pull-up rig. And the straps looped in a consistent manner. Gah! Today was the photo shoot for the website. My good friend and photographer extraordinaire, Rona, was there to work her magic. I’m anxious to see the pics! The entire de Leon crew attended the 9:45 session, with Marianne, Melinda, Steve, and Jeff. A HUGE crowd attended the 11 session, including Amanda, Rosa, Henry, Robin, Ashlee, Angie… too many to list! Most graciously stayed until 1 so that Rona could take additional photos. Thanks to all who participated in today’s festivities! It’s hard to believe that CFS has been open for business for just a week. Wow. 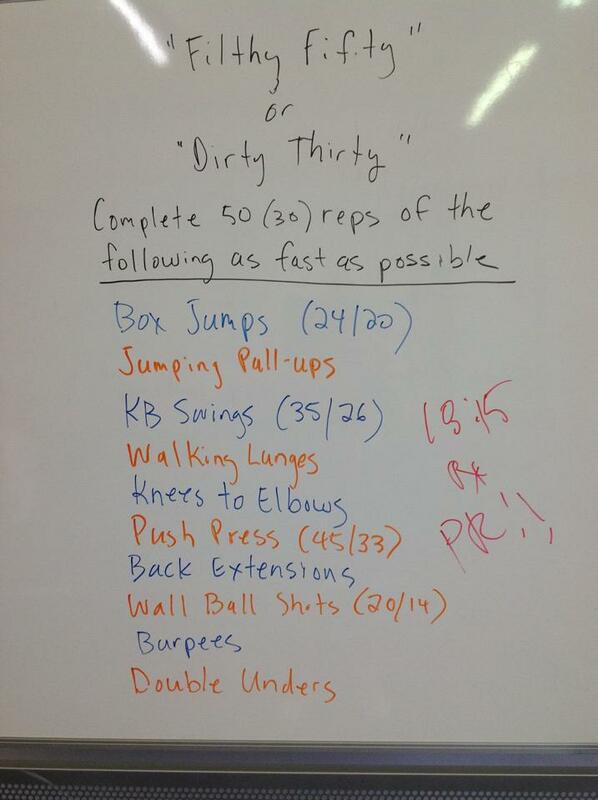 So that Rona could capture folks in a variety of activities, I programmed Filthy Fifty today. I had hoped to participate in the 11 session and have Jeff coach, but there were far too many people for this to happen. Jeff was smart to insist that I coach and he assist. I have a very loud voice, and am good at herding cats crowd control. I was, however, bound and determined to complete this benchmark WOD for only the third time since beginning my CrossFit journey, once at CFD (2011) in a time of 23:23 and once at CFZ (2012) in a time of 23:00. I ate a protein bar and began the WOD at 1:15. I was already tired at the start. My goal today was to finish in 20 minutes or less. My strategy was to work at a steady pace, and to rest as little as possible. I completed box jumps, jumping pull-ups, KB swings, and walking lunges unbroken, although certainly not at a breakneck pace. While completing KB swings I thought, “I should be doing these much more quickly. It’s only 35 pounds. But wait, why kill myself now? There’s much more work to be done.” So I kept working at a relatively moderate pace. I completed 15, 10, 10, & 5 reps of unbroken, kipping knees to elbows. I mixed up kipping and dead-hang knees to elbows for the last 10 reps. I completed push presses in reps of 35, 15, & 10 unbroken reps. I did, however, hit my chin on the bar on the 40th rep. I almost dropped to the ground it hurt so badly. Oh, well, at least I didn’t cut myself and bleed all over the pollen-coated floor. I completed back extensions unbroken. The wall ball shots nearly killed me. I was only able to complete 5 reps at a time. Ten rounds of 5 reps take a hell of a lot of time. I was getting very tired of picking the ball up off of the floor. I began burpees at a very even pace, telling myself that I could complete in 5 rounds of 10 reps. After having completed the 10th rep I still felt good, so I continued. Fifteen, twenty, twenty-five. I kept going. I was able to complete all 50 burpees unbroken, again at a moderate pace. Double unders. Faithful readers know that double unders have often been the bane of my existence. Not today! I completed 50 unbroken double unders, even beginning with a double under. I had positioned myself so that I could see the clock. I finished in 18:15, achieving (and I’ll even say exceeding) my goal. I haven’t achieved a PR in a very long time. Today I did. Boom. ‹ PreviousJeff is stronger than Paul.